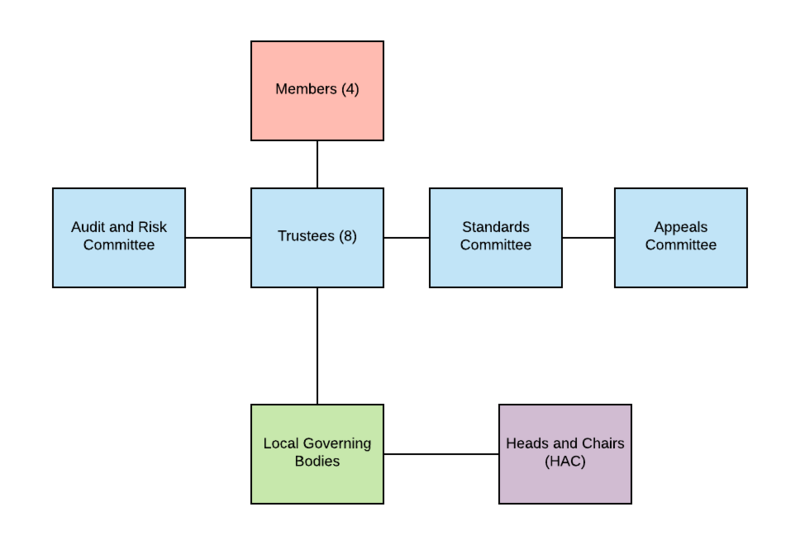 Academy Trusts have a prescribed governance structure comprising of Members, Trustees and Local Governing Bodies. Members - determine the ethos and purpose of the Trust (i.e. the provision of education) and the way it will be governed (which are set out in the Articles of Association) and will have a right (not an obligation) to participate in governance by appointing and removing Trustees. They also have a right to receive the Trustees' annual report and accounts and to attend general meetings of the trust. Members & Trustees marked * also ensure that the Christian distinctiveness and values of the Church School continues to be a core part of all aspects of school life. Each trustee has chosen to 'adopt' a school in order to gain a better understanding and build good relationships with them. Local Governing Body - each of our schools will continue to have its own 'Local' Governing Body. They will continue to hold the school's leadership to account, monitor outcomes and the experiences for children at their schools, be involved in the school's strategic direction, review policies and individual schools' finances. They will ensure safeguarding systems are robust, meeting statutory requirements and ensure health & safety policies and practice are in place. Heads and Chairs Committee (HACC)- is in addition to the above. This will consist of Headteachers and Chairs of Governors (or a governor representative) from each school. Their role will be to discuss MAT issues, liaise with the Local Governing Bodies and carry out some aspects of the MAT's work.